If your family has outgrown your current vehicle, and you want to slash your gas costs, you should consider the 2017 Toyota Prius v. With more height, width, and length than the other Prius models, the Prius v is the largest of Toyota's Prius family available. That means more room for everything you might want to take along when you go camping, shopping, or just to the grocery store. Your passengers will love the roomy backseat, too. And whether your mission is to save the Earth or you just want deep cuts to your current fuel bill, you will appreciate this peppy wagon's hybrid technology. Like the other Prius models available at Toyota on Nicholasville, the 2017 Prius v gives drivers tremendous gas mileage. It' one of the things that made their Prius family of hybrid cars famous. So why not come to Toyota on Nicholasville today to see our complete inventory of the Toyota Prius v? Our selection of the new Prius v includes all the trim levels and colors you want to see. Our experienced sales representatives can provide you with all the information you need about the new Prius v. We are also happy to take you out to test-drive this fun hybrid wagon. Are you looking to lease a new Prius v? Just ask and we will fill you in on all the details about our leasing options. Come to Toyota on Nicholasville today for our best deal on a Toyota Prius v.
Keeping your family safe on the road is your most important priority. So when you are thinking about buying a new car, you want to make sure it comes equipped with the safety features that will keep your family from harm in the event of an accident. With the Toyota Prius v, Toyota provides ample safety features to do just that, from the hybrid wagon's seven airbags to its LATCH restraint system that helps protect young children. When you buy or lease a new Prius v, you can count on standard safety features like Toyota's Tire Pressure Monitor System, Brake Assist, Antilock Braking System (ABS), Enhanced Vehicle Stability Control, and many other built-in safety measures. Find out more from one of Toyota on Nicholasville's friendly sales professionals. Shopping for a 2017 Prius v means you have options. More specifically, when it comes to trim levels, you can choose from the Prius v Two, Prius v Three, Prius v Four, or Prius v Five. Buying the Prius v Five gives you the "loaded" version of the car. But if you don't need as many features, choosing the Two, Three, or Four might be a good choice for your family. No matter which trim you buy, Prius v offers a ton of great options that you will love. Enjoy features like Toyota's Entune Audio system, cruise control, power windows and door locks, a rear spoiler, and plenty more. Ask our helpful sales staff if you have questions about Prius v trim levels. We're always happy to help. Fuel economy is a major concern these days. And if it's one of yours, it's no wonder you are considering a 2017 Prius v. Like all the other Prius models, you can depend on the Prius v to help you make deep cuts to your fuel bill. The EPA estimates that the new Prius v delivers 41 miles per gallon with combined city and highway driving. That comes to 43 miles per gallon in the city and 39 miles per gallon when you drive on the highway. Qualifying as a Super Ultra Low Emission Vehicle (SULEV), the 2017 Prius v also promotes a cleaner environment and reduce harmful emissions. Toyota also includes an ECO Monitoring system on the new Prius v. These features help you learn to drive in a fuel-efficient manner so you can get the most from your Prius v. The 2017 Prius is equipped with a 1.8-liter engine. The 4-cylinder, inline engine works with other powertrain components to give drivers 134 net hp. You can also customize your ride according to your needs; Four driving modes allow you to focus on conserving gas, quicker acceleration, or running on battery power alone for a short distance. Questions? Talk to a sales specialist at Toyota on Nicholasville's to get more information. Your new Prius v gives you all the storage room and cargo space you are looking for. So go ahead and pack for your next trip. Your Prius v can stow all the baggage you want to take with you. With the back seat set to its normal position, you have 34.3 cubic feet of storage to work with. But sliding the seat forward increases cargo volume to 40.2 cubic feet. Folding the back seat down maximizes available cargo space, providing 67.3 cubic feet for transporting larger items. You can also tuck your umbrella or gloves away in one of this hybrid wagon's many cubbies and storage compartments. You will be happy with your new Prius v, but you will also love the peace of mind you get from Toyota's warranty protection plans. Your 2017 Prius v purchase includes Toyota's Basic New Car Warranty, which provides full coverage for 36,000 miles or 36 months for almost all of the vehicle's parts, excluding tires and other parts requiring normal periodic replacement. For the powertrain, Toyota's Powertrain Warranty plan has you covered 60 months or 60,000 miles. You also receive Toyota's corrosion and perforation coverage for 60 months, with no limits on mileage. Learn more about Toyota's warranty coverage from one of our helpful and experienced sales professionals. Call today or come to our Nicholasville Toyota dealership to get answers. If you are sold on the idea of buying a Toyota Prius v, come to Toyota on Nicholasville. Our sales team is ready so schedule a test-drive today. We think you will love everything about this spacious, fun-to-drive hybrid wagon. At Toyota on Nicholasville, you will find an ample inventory of the new Toyota Prius v. Come to our Nicholasville Toyota dealership or shop our online inventory of the 2017 Prius v online now. 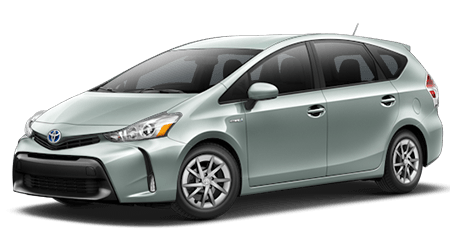 Serving Nicholasville, Richmond, Georgetown, and Frankfort, KY, Toyota on Nicholasville has the Toyota Prius v you want, so visit us today.